3 Panama cops injured in terrorist attack that killed 10. 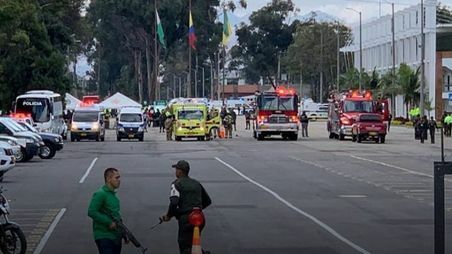 THREE PANAMANIAN police cadets were wounded in a terrorist attack on a leading Police academy in Bogota, Colombia, that killed 10 and wounded 65, some critically on Thursday, January 16. A man blew up a powerful car bomb in The government Subbed him an "insane terrorist which is shaking a country striving with its peace efforts. Although everything seems to indicate that the man died in the attack, the authorities have not confirmed his death or his connection with any of the armed groups that still operate in Colombia, financed by drug trafficking, after the peace pact with the former FARC guerrillas in 2016. A health official from the Armed Forces told a local radio station that the vehicle apparently "abruptly" broke into the police headquarters. "He entered rapidly, almost hitting police on duty and then came the huge explosion," said Fanny Contreras. According to her version, "there was another small explosion", although according to authorities of the Colombian are reportedly working on the assumption the of a single explosion. "I have given orders to the public force to determine the perpetrators of this attack and bring them to justice," said Colombia President Ivan Duque. Latest report from Bogota puts the number killed at 21 with 68 injured. It said Panamanian police cadets. That would indicate they were enrolled in the Police Academy. What were the Panamanian Police doing at a Colombian Police Academy. I'm sure they were training, but it would have been nice to have mentioned that in the story.